Oh Lordy. Here we've all been buying fancy spot treatments and expensive elixirs to rid ourselves of acne, when it turns out the answer to our problem might have been growing in the herb garden all along. Thanks for telling us, Mother Nature. Yes, a new study has found that herbal preparations of thyme might be more effective at treating acne than current prescription remedies. Researchers from Leeds Metropolitan University tested three different tinctures—made from thyme, marigold and myrrh—on the bacteria that causes acne. They discovered that while all three tinctures could kill the bacteria after five minutes, the thyme tincture was the most effective. 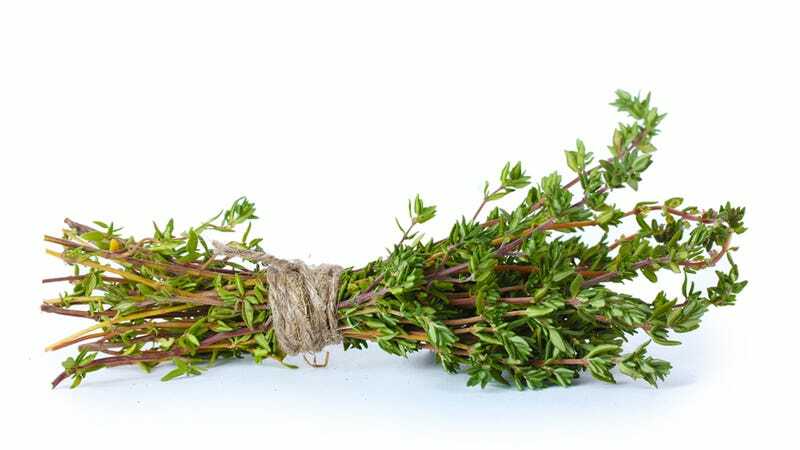 They also discovered that the thyme had a bigger antibacterial effect than benzoyl peroxide (a common acne treatment) did. The tinctures were made by steeping the herb in alcohol, which draws out the plant's active compounds. The three herbs they tested have been used in some antibacterial skin washes before, but this is the fist time they've been demonstrated to be effective against the bacteria that causes acne. Sadly, more research needs to be done before thyme tincture can be declared clinically effective for acne, but if these finding are confirmed, it could be a great, more natural and gentle alternative to acne treatment. Of course, if you want to make some kind of thyme poultice or tincture on your own and test it out, there's nothing to stop you. While you're at it, why not go all out and stick a few sprigs of rosemary up your nose too. You could be clear-skinned and clear-headed in no time—or you could just look like an idiot with herbs smeared all over your face. But either way, you'll smell delicious.